Download and fill this Excel File with your data, then upload it to search for similar profiles in SITVIT2. If you are using a recent version of Microsof Excel, please convert your file to Excel 2003 (XLSX files are not allowed in this analysis). Make sure that you are strictly respecting the good format for all Spoligotype and MIRU-VNTR markers. 5-locus Exact Tandem Repeats (ETRs) or VNTR order: A, B, C, D, and E.
MIRU12 order: MIRU 2-4-10-16-20-23-24-26-27-31-39- and 40. MIRU15 order: MIRU 4, 10, 16, 26, 31, and 40, ETR-A, ETR-C, QUB-11b, QUB-26, QUB-4156, Mtub04, Mtub21, Mtub30, and Mtub39. MIRU24 order: classical 12-loci pattern followed by ETR-A, ETR-B, ETR-C, QUB-11b, QUB-26, QUB-4156, Mtub04, Mtub21, Mtub29, Mtub30, Mtub34, and Mtub39. Furthermore, the MIRU-VNTRs loci labeled by letters A, B, C ... indicate respectively 10, 11, or 12 etc... number of copies. 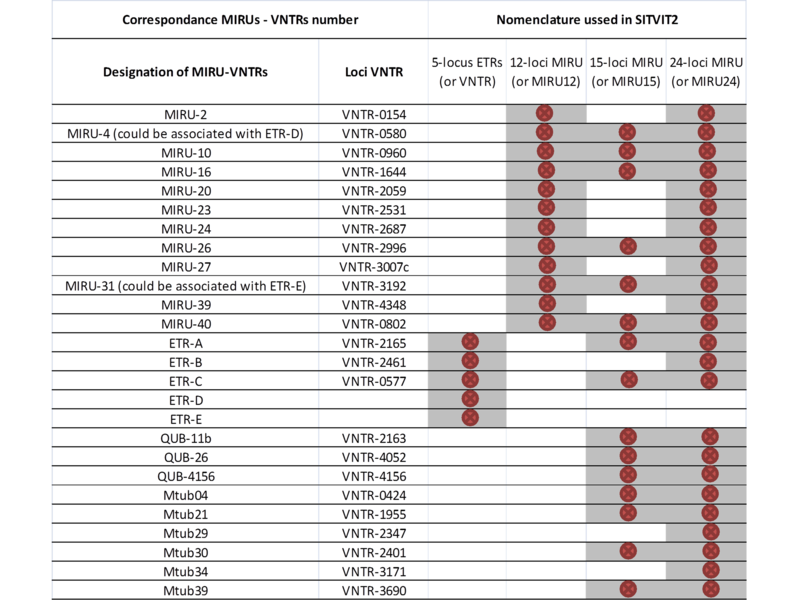 Correspondance nomenclature between designations of MIRUs/ETRs/QUBs/Mtubs and VNTRs loci is visible as an Excel File or as a PNG figure. Not defined (ND) statement indicates that a spoligotype or MIRU pattern does not exist in our database (i.e. this profile could be either null, an orphan, or a new pattern not yet reported in our database).